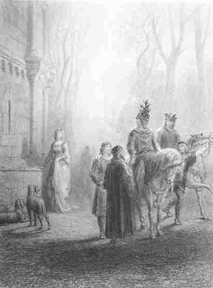 She watched as he approached the castle gate, weary from another failed return to Camelot. At dusk she would call for the sorceress. They would take the silken cap, and chant old words and sing old rhymes, until the cap was bright as golden hair and the sewn-in pearls were the circlet of a queen. When she donned the cap, he would be there, beside the door. He would call her Guinevere. All night he would call her Guinevere. They would roll in the sheets, and cry with pleasure, and he would laugh. But only for the night, as it always was, the first night of each stay. The magic would not hold. At dawn she would find him in the garden, pensive, gazing at the lake. She would follow as he walked with Galahad, their son, telling the boy of knights and quests, and more and more distractedly showing him how to ride, or to hold a bow. Soon she would see him in the fields, with the peasants, cutting the wheat, bundling the sheaves, joking and singing, then drifting to the carts and looking west, down the familiar road. One day he would be gone, on the long journey to Camelot. Away for weeks now, each time getting closer, almost in sight of the pennants, almost in sight of the walls, until the shame of his life, his secret child and shadow wife, undid him and turned him back again. She would wait, at moments eyeing the longboats in the lake, and wondering—when he finally made peace with himself and with the queen—if she would end like the other Elaine, the forsaken maid of Astolat, cold, dead, floating down the river on a silver barge, with a sheaf of lilies in her arms, and a letter to her one true love. But she was not that Elaine. She was a woman of Corbenic, the daughter of a king. She would mind the boy, and tend the garden, and feed her aging father with a wooden spoon. Most of all, she would wait for the next first night. And when they ceased, how would she ever know? There was no end to expectation. So, today, she ran down the steps and welcomed her love at the castle gate. She wiped the dust from his face with her hand, and pushed back his tears with a linen cloth. Tonight they would roll in the sheets, and cry with pleasure, and he would laugh. Tonight, in the magic of her rival’s flaxen hair, in the refuge of her rival’s hated name, she would forget she was only Elaine. Greer Woodward lives on the Big Island of Hawaii, in the shadow of Mauna Kea. Her work is in Twisted Cat Tales, Beyond Centauri, the “Literature of Editors” issue of Susurrus Magazine, and upcoming in Strange Stories of Sand and Sea. She’s a graduate of Clarion West and an associate editor for Sybil’s Garage.